Weddings in the Bahamas on the beach at sunset is most popular spots for couples’ ceremonies. Make it a wedding for two and it becomes even more special. 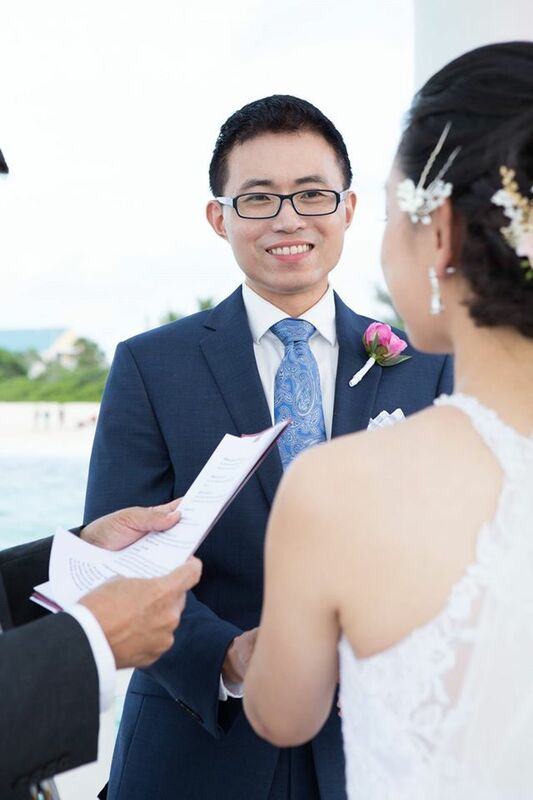 Chinese couple, Ying and Lu, now living in Texas, decided to make their day extra special by flying to Nassau for a four-day weekend to tie the knot. Vows were exchanged on the Sandyport overwater pier at Blue Sail Restaurant. Guests of The Cove Atlantis the couple flew to Nassau one day before their magical event. The event was documented by Bahamas wedding photographer, J. Co Photography and Film. 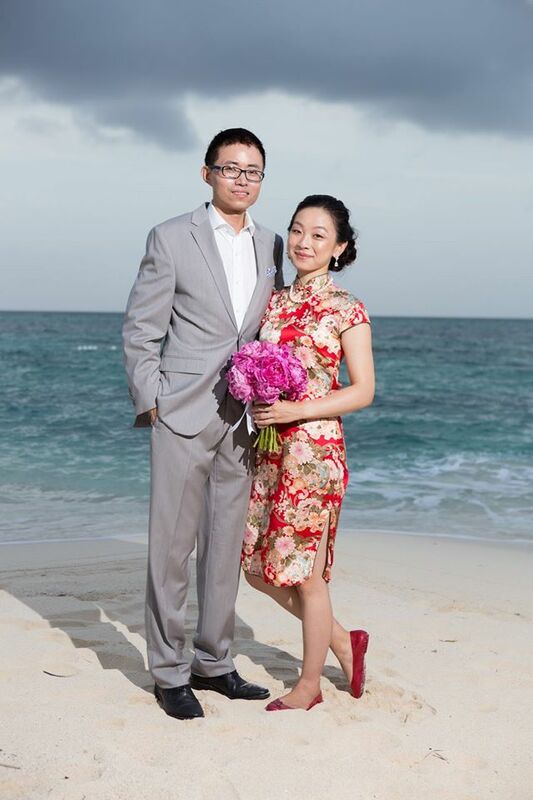 After the white dress wedding, the bride did a change into Chinese dress for more Bahamas wedding photos. A Champagne toast and cutting of the cake followed. Ying and Lu’s ceremony was performed by Justice of the Peace Reg Eldon. The bride carried a beautiful strawberry peony bouquet. The groom’s boutonniere matched. Styled Beautiful Events created the bride’s bouquet. On location hairstyling and makeup were by the Apryl Weech of the Hair Studio. The wedding cake was made by Take the Cake Bakery. 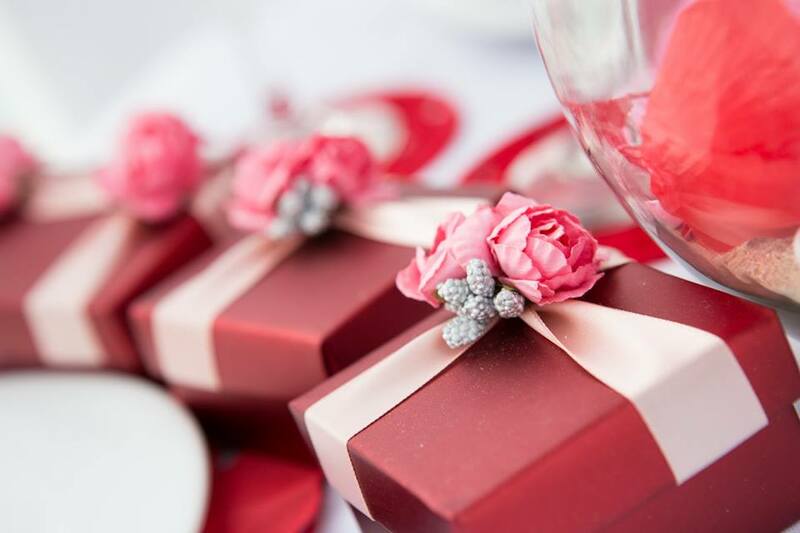 The bride and groom graciously treated all wedding vendors to gifts of chocolates. Chic Bahamas Weddings plans beach weddings anywhere in The Bahamas for two to 100 people or more. We’re happy to work with you to create a vision and style unique to you. 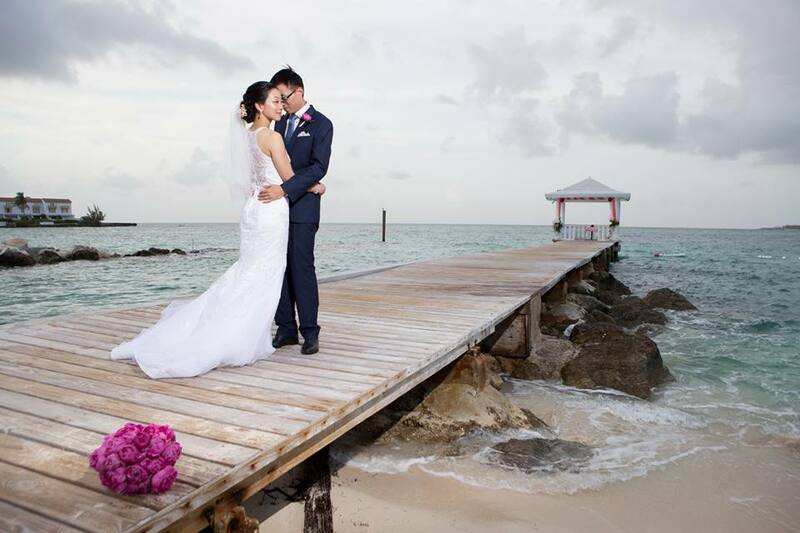 Your wedding in Bahamas may take place on any one of our 700 islands and cays. 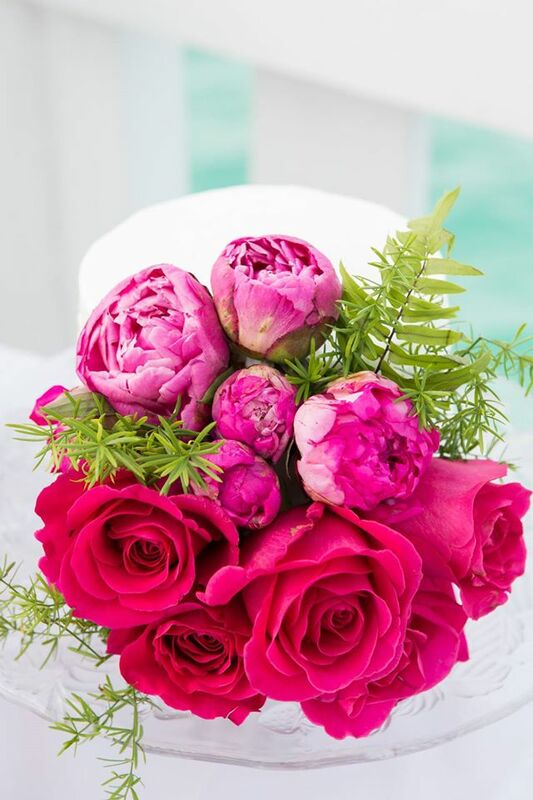 We have planned weddings on Abaco, Andros, Eleuthera, Great Exuma, Exuma Cays, Harbour Island, Nassau and Grand Bahama Island. 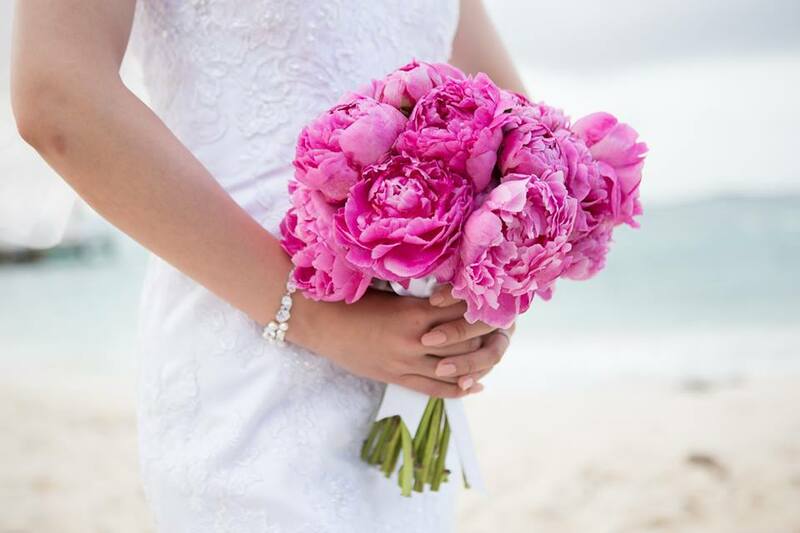 We work with you to find the perfect Bahamas wedding destination for your event. Whether you want a Bahamas wedding all-inclusive or a la carte, we can help you. Contact us today to start planning your 2017 or 2018 wedding or honeymoon at a resort or hotel. We’re delighted to help you!